Here is a look at some of the this week’s top high school sports events. Monday — Desert Pines at Coronado, 6:30 p.m. The Jaguars may get point guard Capri Uzan back to join high-scoring forward Trevon Abdullah-Booker. They’ll need all the firepower they can get against a Coronado team led by returning all-state forward Kennedy Koehler and transfer Will Weems. Tuesday — Durango at Clark, 6:30 p.m. The Chargers got off to a strong start, and will look to keep things going against a strong Durango team in this Southwest League matchup. The monstrous tournament features six boys divisions. Nearly 20 local teams are in the field. Thursday’s games will be played at Bishop Gorman and Faith Lutheran, with Desert Oassis, Durango and Heinrich YMCA also hosting games on Friday and Saturday. The tournament continus on Dec. 19 and 20. This tournament returns this season and features 13 teams, including nine local squads. Play continues Dec. 19 and 20. Wednesday — Spring Valley at Bishop Gorman, 5 p.m. The favorites in the Southwest League square off in a game that will have playoff ramifications down the line. The Grizzlies were a power in Division I-A the past two seasons, and Gorman was the Sunset Region runner-up. 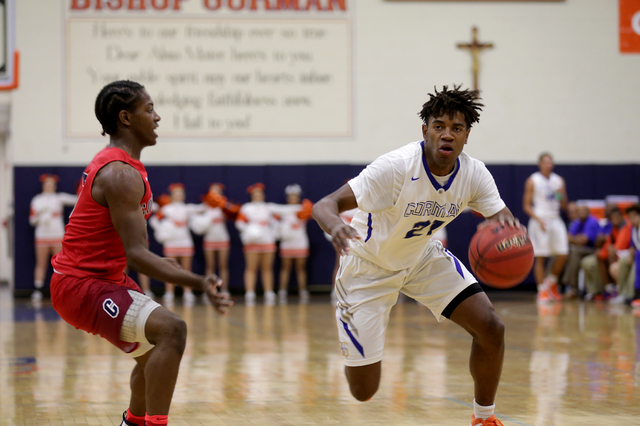 Nearly a dozen local teams join host Bishop Gorman in the prestigious national event, which continues Dec. 19 and 20. Monday — Green Valley at Boulder City, 4:30 p.m. The Eagles will be looking for their 50th consecutive win against one of the top teams in the Class 4A Sunrise Region. Green Valley, in fact, was the last team to defeat Boulder City. The Gators won an 18-13 playoff game on Feb. 24, 2014. Tuesday — Shadow Ridge at Desert Oasis, 4:30 p.m. The Mustangs are one of the hottest teams in Southern Nevada and will face a historically good Desert Oasis squad on the road. This could be a preview for a future playoff game. Thursday — Las Vegas at Coronado, 4:30 p.m.
Coronado overcame an 18-point deficit to knock off the Wildcats in the Sunrise Region semifinals last season. Las Vegas hasn’t forgotten and should come out fired up. Thursday — Foothill at Palo Verde, 4:30 p.m.
Foothill, which is a perennial top team in the Sunrise Region, isn’t quite used to losing this often early in the season. The Falcons will look to get back on track against an always-tough Sunset Region opponent. The five-time defending state champion Green Valley Gators take the mat against Liberty, which finished third in the Sunrise Region last year, and Silverado, which finished fourth. Thursday — Las Vegas at Boulder City, 6 p.m.
Two runners-up from last years postseason meet when the Wildcats meet the Eagles. Las Vegas placed second in the Sunrise Region last season while Boulder City was second in the Division I-A (now Class 3A) Southern Region. One of the premier events of the season will allow area wrestlers to see how they stack up against top out-of-state competitors.